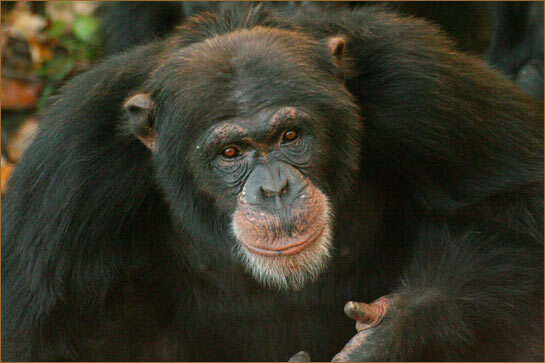 The Why Files | Chimps: Another human trait? 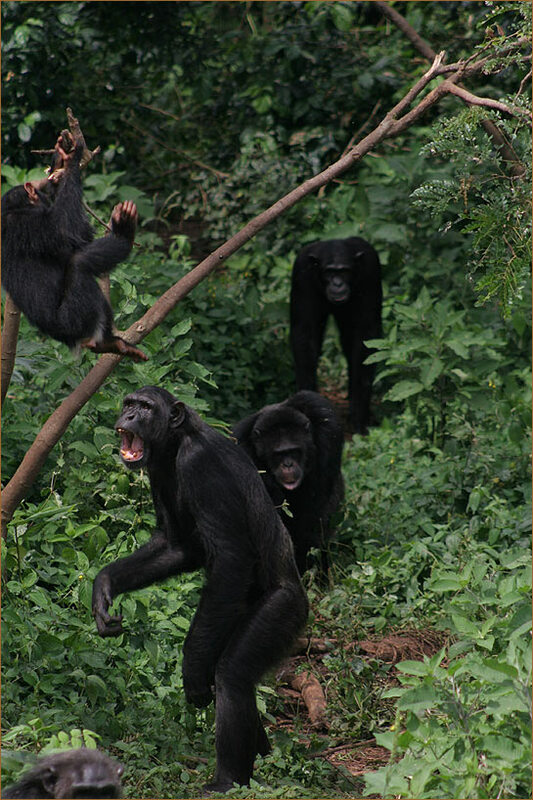 are an ornery primate, and they can remind us of ourselves: Chimps live in groups with a clear-cut hierarchy. 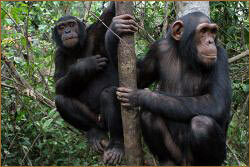 They battle for dominance, use tools and even murder fellow chimps. Sure, we haven't caught chimps reading "Insanely Inane: The life and incredibly insipid times of Paris Hilton." But are you ready for chimps that help unrelated chimps, just for the sake of being helpful? That's the upshot of a new study performed in Uganda, in which chimps were just as altruistic as human toddlers. It may surprise some parents, but toddlers will help strangers in laboratory tests. Altruism itself is common among animals -- ants and bees will die to defend the colony, and birds and mammals will fight to the death to save their young. But human altruism is supposed to be different, says study leader Felix Warneken, of the Max Planck Institute for Evolutionary Anthropology, in Leipzig, Germany. "Some altruistic behaviors go beyond protecting the kin. They are not reciprocated in the immediate situation, they are done toward strangers, and they are not pre-programmed, so they can be done in a novel situation." Until now, the only species that satisfied this definition of altruism -- helping true strangers -- is the selfsame species that makes war on strangers: the human. The study was done at the Ngamba Island Chimpanzee Sanctuary in Uganda, a refuge for orphans that were rescued during an illegal export. 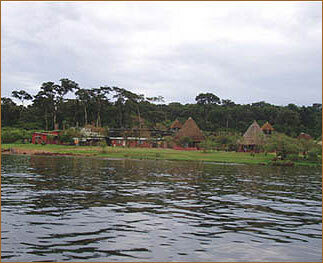 The animals live in the rainforest, but are fed and sheltered by people. The researchers first tested 36 chimps and 36 18-month-old humans, and found them equally likely to fetch a stick that was beyond the reach of the experimenter. Curiously, receiving a reward for helping did not change the performance of either the toddlers or the chimps, but both species did behave more altruistically when the experimenter made a big show of trying to reach the stick. Next the researchers retested the 18 chimps and 22 toddlers who had helped at least once in the first test. In a situation where subjects had to exert some effort to be helpful, they found no significant differences between chimps and people. The most meaningful experiment, in terms of real-world behavior, came next: Would the chimps behave altruistically toward each other? When the chimps were given a chance to open a door so a second chimp could get a snack, the chimps still were willing to help. 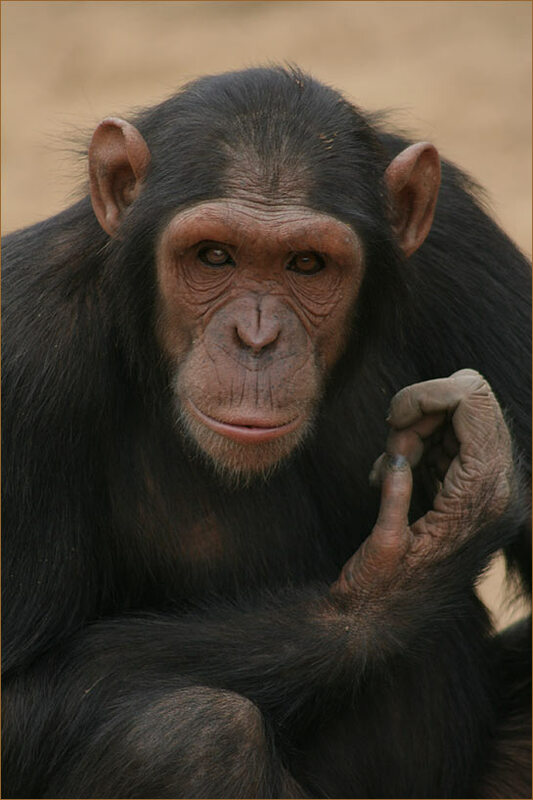 In designing the experiments, Warneken and colleagues tried to rule out alternative explanation for helpful behavior seen in previous chimpanzee research. First, the helped and the helper were not related. "It's often said that beneficial behavior can be explained by kin selection; you give up food for another individual, but because there is this genetic relationship, in a sense you are helping yourself," says Warneken. So what accounts for altruism? Helping others without the prospect of immediate reward, Warneken admits, "is a problem for biological theory." If I help an unrelated animal get food, that may leave less food for me or waste my precious time and energy, reducing my fitness (ability to propagate my own genes). In terms of survival of the fittest, "We cannot have a behavior that will really decrease fitness," says Warneken. "This is the puzzle of altruism." In the long run, however, helping others may cement alliances and make others more likely to return the favor. This would increase the evolutionary fitness of an altruist, and it is here that we may find an explanation for altruism. In a comment in PLoS Biology, Frans de Waal, a primatologist with Emory University, wrote, "Perhaps it is time to abandon the idea that individuals faced with others in need decide whether to help, or not, by evaluating costs and benefits on the spot. Instead, natural selection may have made these calculations for them. Weighing the consequences of behavior over evolutionary time, natural selection has produced psychological mechanisms designed to produce spontaneous helping that, on average and in the long run, works to the advantage of both actors and recipients." The new finding does further blur the boundary between humans and our closest relative, the social, hierarchical, tool-using and occasionally murderous chimpanzee. "The study tells us that a primordial form of altruism is a trait that we may share with our evolutionary ancestors," says Warneken. "Culture and socialization are not the only factors in the origin of these behaviors." If a physical structure appears in two closely related organisms, biologists assume that their common ancestor must also have possessed that structure, and the gene for it. If, as Warneken argues, behavior emerges from the totality of an organism's genes, then the primate that gave rise to humans and chimps about 6 million years ago probably also helped others -- just for the sake of it. This uber-grandparent was, in other words, an altruist. But if we share an altruistic heritage with chimpanzees, why do humans behave more altruistically than them? "We have a natural tendency to be altruistic, this is a commonality with the chimp," says Warneken. "Still, there are crucial differences." In his study, for example, chimps were slower to begin the altruistic behavior. "These differences may be accounted for by the fact that when we raise our young, we try to facilitate and maintain these roots of altruism. Maybe the reason why this altruism is not so omnipresent in the chimp is that they don't have parents who raise them this way." • A brotherhood of chimps. • Dog knows 260 words! • Animal behavior shows cultural learning. • Warneken F, Hare B, Melis AP, Hanus D, Tomasello M (2007), Spontaneous altruism by chimpanzees and young children. PLoS Biol 5(7): e184. doi:10.1371/journal. pbio.0050184. • With a Little Help from a Friend, Frans B. M. de Waal, PLoS Biology | www.plosbiology.org, July 2007 | Volume 5 | Issue 7 | e190.